Versatile. Flavorful. Healthy. Tasty. Spicy. Easy. These adjectives all describe one of my favorite dishes—chili. An ancient dish dating back to the 1500's, chili has stuck around for the reasons that I describe above. I also love that it's great as a meaty dish (pork, chicken, ground beef, and turkey all make for great chilis), but also works as a vegan dish (chuck the meat and cheese, add lots of beans, and serve with rice for a complete protein). 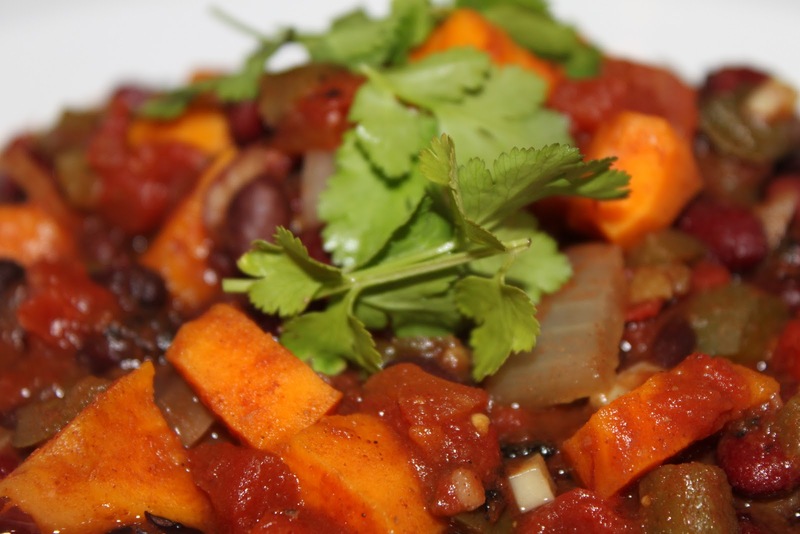 This dish is the latter—a delicious vegan dish that combines sweet potatoes with black beans to make a hearty, filling, spicy, fiber-filled meal. Also, dollar for dollar, you won't beat a big vat of vegan chili. Heat the olive oil in a large, heavy-bottomed pot over medium high heat. Add the onion and bell pepper and saute until softened and translucent, about 5 minutes. Then, add the garlic and saute for another minute. Next, add the chili powder, cumin, cocoa powder, and cinnamon, stirring it into the mixture. Cook for one to two more minutes. The spices should become fragrant. Add the tomatoes, stock, beans, and sweet potatoes and bring the chili to a simmer. Cover and cook over low heat for about 30 minutes, or until the sweet potatoes have softened. Uncover and cook over medium heat for about ten more minutes to thicken the chili if desired. Season to taste with salt and freshly ground pepper. To serve, ladle a generous helping of chili into a bowl. Garnish as desired (see above for garnish ideas—I love serving chili with brown rice, quinoa, or cornbread). Enjoy! This looks delicious! I always enjoy reading and looking at your meat free recipes. Thanks so much! This one sure is tasty! I have to say that even as a NON-veg-head, this recipe looks amazing. Can't wait to try it out!